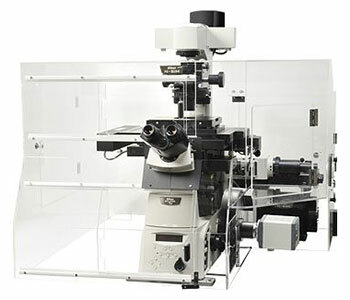 Nikon’s new N-SIM microscopy system can produce nearly two times the resolution of conventional optical microscopes. It combines Structured Illumination Microscopy technology (licensed from UCSF and based on the world renowned Eclipse Ti research inverted microscope) with Nikon’s CFI Apo TIRF 100x oil objective lens (N.A. 1.49). N-SIM also delivers the very fast imaging capability with a time resolution of 0.6 sec/frame.